Best Friends Pet Care – Dog Walking. Cat sitting. First Aid. Pet Care. Have peace of mind. All of our sitters and walkers are trained in Pet First Aid through Walks 'N' Wags Pet First Aid. While cat-sitting, your home will be well cared for in your absence. Group hikes. One on one walks. Where your best is our best friend, too! We offer dog walking, private dog walks, group dog walks, and in-home cat care. Our top priority is the health and happiness of your best buddies, 365 days a year! Designed for owners who are unable to walk their dog, or who just wish to provide them with more exercise and socialization. Best Friends has years of experience providing in-home cat sitting visits and pet sitting visits for other small animals. We take the health and well being of your precious pets seriously. All of our sitters and walkers are fully certified in Pet First Aid. Designed for owners who are unable to walk their dog, or who just wish to provide them with more exercise and socialization. Best Friends has years of experience providing in-home cat sitting visits and pet sitting visits for other small animals. It all started when founder Lisa Wagner set up a Pet Care service that would provide reliable, personal pet care to local pets. Since that time, we have developed an wonderful, loyal clientele, as well as a solid reputation within the local pet community, and are now known as Best Friends Pet Care. Formerly a division of Walks ‘N’ Wags Pet Care, our services began in Kitsilano, Point Grey, and Fairview in March 2000. In 2010, Lisa sold the pet care portion of Walks ‘N’ Wags to her long time manager, Vanessa Johne. Vanessa has since maintained the fundamental practices of the business, as well as the long term commitment we have made to our loyal pet care client base until 2016. In October of 2016, Alicia took over Best Friends, having been Vanessa’s manager for several years. She continues BFPC high standard of care for our new and long-time clients and expanded the business to add Home Boarding and In Office Small Animal Boarding to the list of exceptional services offered. Best Friends provides dog walking and cats sitting pet visits year-round – that’s right, 365 days a year! We do not close for Statutory holidays and our staff are fully trained to step in for one another in the event one of our sitters falls ill or has a personal emergency. Additionally, we do not utilize subcontractors. As an owner and operator of the business Alicia is hands on, and continues to work in the field side by side with her exceptional staff. Our Vancouver staff are caring pet care professionals who are carefully screened and bonded. They receive extensive training and are certified in Pet First Aid too. For many years Best Friends has also offered in-home care for small caged animals. We now offer a more affordable option for those long (or not so long!) trips, boarding in our offices. We are open and staffed 365 days per year and are able to board Mice, Rats, Hamsters, Gerbils, Rabbits, Guinea Pigs and other small caged mammals. At Best Friends, we take the health and well-being of your precious pets seriously. 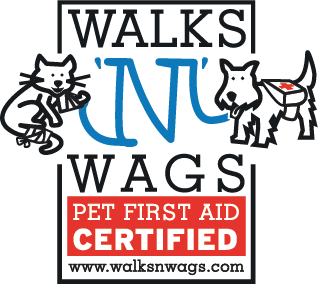 All of our sitters and walkers are fully certified in Pet First Aid, through Walks ´N´ Wags Pet First Aid. The Walks `N` Wags program is designed for both dog and cat emergency situations. Additionally, a large portion on the course focuses on early recognition of illness and steps that can be taken to prevent injury before it occurs. It is the premiere program in North America, with courses running nationally as well as locally. If you would like to learn more about Pet First Aid, or are interested in attending a course, please check out their website at www.walksnwags.com for more information. We are also licensed, insured, and co-operate with all Metro Vancouver bylaws. Worried about leaving your dog home alone while you are gone? Extra long days at work? No yard? Too much energy for you to handle? Common behavioral problems such as barking, chewing and digging are the result of isolation, boredom and insufficient exercise. We can help provide the physical and mental stimulation that your dog needs! We operate primarily on Vancouver’s West Side, Kitsilano, Point Grey, Kerrisdale, Shaunessey, Fairview, Riley Park, Olympic Village, and Yaletown. The service area encircles from Commercial Drive west to Blanca Street, south to 49th Avenue and north to Pacific Avenue. We do not service most of Downtown Vancouver or the North Shore. If you are outside of our area we are happy to refer you to another great pet care service provider. Private dog walking is done in your area, one on one with the walker. This service is tailored for dogs who may not be happy riding in the car, have healing injuries, are very young or very old, are not spayed/neutered, or who may not be comfortable with other dogs. We understand the personalized attention your dog may need. 25 or 40 minute walk lengths are available for dogs of all ages. Senior dog walking is a service close to our hearts. We adore our older doggy buddies and understand their special needs. Senior dog walks are 15 minutes in length and are reserved for dogs over 10 years of age only. House training and socialization is key when puppies are growing up, and we know they require frequent breaks outside to accommodate their needs. Puppy breaks are 15 minutes and reserved for dogs who are under 5 months of age only. Our General pricing is as follows, however please contact us and ask us about our generous discounts. We offer discounts for 2 (or more) dog families, and clients with regular on-going dog walking schedules. With truth and honesty, we can say that Chico loves his friends; the friends that make up the team at Best Friends! In the past, we had tried many things to keep our beloved pet happy and safe while we were on vacation. We even tried a “cat hotel”. Well, as many cat lovers know, cats do not take well to change. The cat hotel was nice enough, but Chico was not happy to be separated from his home and familiar things. Once we began having Best Friends come and visit with Chico while we were away, he became a much happier cat. Best Friends team knows how to take care of him, how to look after him in our absence and the report card at the end of the trip is helpful for us to come home to. Besides, SOMEBODY has to put ice cubes in his water dish while we are away!!!! We can’t say enough to thank you and the team for caring for our family member while we are away. It is helpful to know that our beloved pet is well-taken care for! Vanessa and her team are an amazing resource for us. All of her staff are very dedicated to both our dogs and cats. I love that fact that I don’t have to worry about my animals when they are in Best Friends care. Often I come home from work to see that they’ve left a note to say ‘the girls had a great day today’. It’s just so nice to know that we have Best Friends to take care of our animals. Quite frankly, I really don’t know what I’d do without them. It is so reassuring to know that our dog is well looked after. Thank you, Best Friends! I am so thankful for Vanessa and the team at Best Friends Pet Care because they love our wiener dog, Frank, as much as we do. He loves his hikes with the group in the forest. The whole gang came to watch his big race at Hastings Park. It was great for Frank the Tank to have so many fans cheering for him! My wife and I cannot recommend Best Friends Pet Care highly enough. They do their utmost to accommodate the pet care needs of our irregular lives and Kushy always seems happy and more responsive after they have taken her for a walk. When I was looking for a pet care provider it was difficult to find one that looked after a variety of pets as I had two guinea pigs until I found Best Friends Petcare. I used them for the first time when I went to Ireland for Christmas. Due to severe weather conditions I had to change my travel plans and Best Friends were extremely accommodating. I was impressed when they came out to meet with me and my pets prior to looking after them and to explain their services. I was so pleased with the quality of care they provided for my two cats and two guinea pigs that I have now booked them for dog walking services for my newly adopted dog. Vanessa and her team are phenomenal. My dog is excited to go for a walk with her furry friends, and is tired and happy when I get home from work. Best Friends Pet Care is professional, reliable and best of all, Lexi loves them! I always feel extremely comfortable leaving my cat in the care of Vanessa and her team. They are very responsible, experienced and well-trained. My cat is shy but loves his visits from Best Friends Pet care. I feel my pet is well cared for and my home is well looked after in my absence. Vanessa is also willing to water plants and pick up the mail. I would not hesitate to recommend Vanessa and her team for dog walking and catsitting services. Our lovely Burmese cat Max is a real “people” cat. It is so hard to leave him because he always lets us know how much he misses us. When we leave him with Best Friends Pet Care he is visibly calmer and happier when we return. Best Friends Pet Care makes sure he has food and water at all times. We really appreciate the little notes with updates on his behavior and eating habits. We especially appreciate that they continue care for him until they hear from us that we are back home. As frequent travelers we no longer fear that flight delays might result in Max being left unattended. We used to leave him home for up to 2 days but now get Best Friends to come in even if we are gone for 24 hours. Recently, due to a last minute change in my plans I was at home when one of the Pet Sitters arrived. I had the pleasure of watching Max run to the door to greet her. She offered to reschedule but he was obviously quite happy to see a friend. I was trying to get out of the house so I was rushing around and I was so happy to hear her doting on Max. He was purring and rolling over to have his tummy rubbed, clearly relaxed and trusting. We are so happy to have Best Friend’s Pet Care as part of Max’s family. Best Friends has years of experience providing in-home cat sitting visits and pet sitting visits for other small animals. Our cat sitters will visit your home daily to give your pets the love and attention they deserve in your absence. In home cat sitting reduces your pets’ stress while you are away, and allows them to hang out in their favourite haunts, eat familiar food, play with their same toys. They also receive special one on one attention that only a loving cat sitter can provide. Our cat sitting service is East/West from Victoria Drive to Blanca Street and North/South from Venables to False Creek and Kits Point, all the way up to 41st Avenue. We also service Yaletown and the area surrounding Science World and the Olympic Village. Parking (street or secured underground) must be provided for cat sitting visits. Our General pricing is as follows, however please contact us and ask us about our generous discounts. We have a “long-trip” discount for cat visits of more than 14 days. We do not surcharge for multi-cat homes. Prices are GST inclusive. Please inquire for twice daily rate. For many years Best Friends has also offered in home care for small caged animals. We now offer a more affordable option for those long (or not so long!) trips, boarding in our offices. We are open and staffed 365 days per year and are able to board Mice, Rats, Hamsters, Gerbils, Rabbits, Guinea Pigs and other small caged mammals. No birds or exotics please! Inquire for pricing. Additionally, we do not utilize subcontractors. This is peace of mind that is unique to our company. We have experience with many other small critters too! Including: birds, rabbits, rats, guinea pigs, and fish. We also have cared for numerous exotic pets including an iguana, a raccoon, stickbugs, hissing cockroaches, and tarantulas!Please note we drive logo-free vehicles. This maintains your privacy, and reduces the possibility of a break-in during your absence. The cat sitter will also collect mail and newspapers, change around lights and blinds, ensure courier packages are held, and we even water plants! Rest assured, your home will be in fine form upon your return. Please note we drive logo-free vehicles. This maintains your privacy, and reduces the possibility of a break-in during your absence. Calls and emails received after hours will be returned the next business day unless we deem them to be an emergency.